Experts in combining measurement solutions and process engineering in paint and coatings processes. LCM: Color Measurement of coatings in the liquid phase; SuMo: Fully automated measurement of corrosion test panels. Which task is fulfilled with Q-Chain® LCM? Usually, colorimetric evaluation of coatings and pigments is done by a manual measurement of the dried surface. This process needs up to several hours and delays production, because the release is depending on the results of the measurements. In addition, test series are quite time intensive with “dry” methods. It was shown in several tests, that the Q-Chain® LCM is often even more precise than the “dry” measurement because the method has less manual interaction and less process variables. How does Q-Chain® LCM work? The liquid coating material is put on a very precisely rotating disk (Q-Chain LCM mono on a cylinder) and the film is measured by a modern 3-angle (LCM mono: 1 angle) spectrophotometer. The values are gained, stored and evaluated in our software and put into a database. The whole process takes not more than 3 minutes! All values can be evaluated according to different standards regarding dE, tinting strength, metamerism etc. In addition, effect colors can be measured. How can Q-Chain LCM® be used? Q-Chain® LCM is the basis for shortening and optimizing the process flow in production of colors, pigments and coatings. 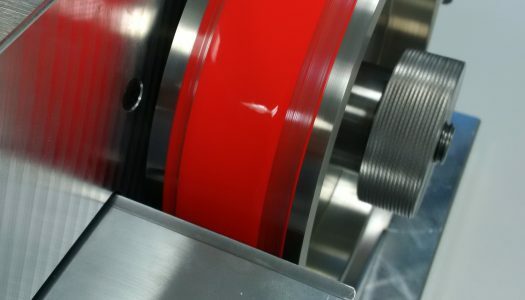 Starting with the stabilization of the release process and the significant reduction of the cycle time, previous and following production steps can be made more efficient, too. In the end, this proceeding allows to reduce the tinting steps together with reduced cycle times. Why does Q-Chain® LCM lead to more efficiency? Faster testing enables companies to accelerate the production process. The method can be used in all process steps – goods receipt, semi-finished products, finished products. If raw materials and semi-finished products are adjusted well, finished products can be finished much faster! Our Q-Chain® LCM Software consists of four modules, which cover the tasks of measurement, quality control, R&D and production. The backbone of the software is the Q-Chain® Database, where all measurements are stored as raw data. Easy to use and intuitive handling, open interfaces and an industrial based data format lead to a database, which can be extended to a quality data base. The high-end version of the Q-Chain® LCM has a color measurement technique that uses three angles. This allows the measurement of effect colors and components with effect pigments very precisely. This is done by a rotating disk, where the paint is put on and measured with a special designed spectrophotometer. Q-Chain® LCM Mono is based on a rotating cylinder and the paint is measured with a one angle spectrophotometer. This equipment is a low-cost alternative for solid colors, pigment pastes and pigments. 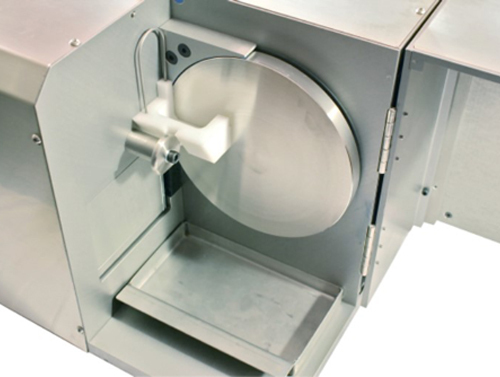 Laboratory scale, small space necessary, can be used at different places (close to production as well). Supply includes software, training and PC or laptop. What is Q-Chain® SuMo made for? According to DIN EN ISO 4628 – 8, corrosion test panels are often evaluated with visually and a use of a ruler or similar measurement devices. On one hand, this is quite a lot of effort, on the other hand, this procedure is unprecise. 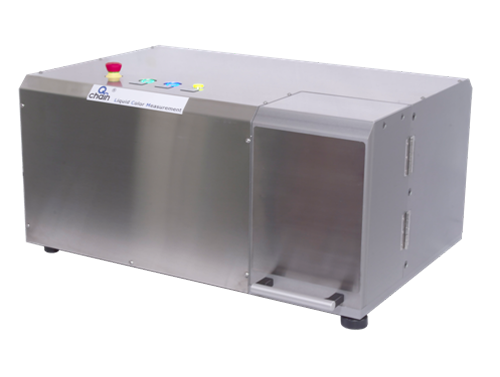 Q-Chain® SuMo is a fully-automatic measurement device for the measurement of corrosion test panels, starting with the generation of measurement grids up to the automatic evaluation of these panels. The sensor type allows a detection of delamination as well as rust without further treatment of the test panel (scratching). How does Q-Chain® SuMo work? The measurement principle is based on impulse thermography, which can differentiate between delamination and rust. The signals differ significantly between adhesion and non-adhesion of a layer, which allows a precise differentiation. The sensor is built into a X/Y machine (approx. 60 x 50 x 50 cm), which allows a grid in 0,15 resolution. The system does not require a removal of the delaminated layers and saves time for preparation, but also reduces the user influence by potential damages on the surface. It allows a multiple use of the corrosion panels and potentially a repeating weathering of the same sample. There is also a device for automatic panel handling, which leads to a serial handling of the panels. The panels are labelled by barcodes or QR-Codes, which are read by an integrated camera. This makes it possible to match the results to the panel information in the database. Evaluations e.g. according to DIN EN ISO 4628 – 8 contain more information than required. For example, areas with delamination and no rust (yellow) can be visualized against areas with rust (red). This differentiation between delamination and rust can lead to further insights into the corrosion behavior of the system. ORONTEC’s software for Q-Chain® SuMo enables the user to create measurement grids in an intuitive and easy way. These grids can be used for single panels or a series of panels. As usual, the Q-Chain® Database leads to a safe and unfiltered storage of measurement data. Open interfaces allow an integration into existing systms, the database can be run locally on the PC or in the intranet. Reports are saved in the MS Excel™ data format.